After a demanding 90 days, the General Assembly’s 2017 legislative session has ended. From January 11th-April 10th, the General Assembly met to debate and pass bills that affect residents across the State, including the FY18 operating and capital budgets. I have continued to advocate for causes important to Baltimore, including more efficient and effective transportation, criminal justice reform, environmental issues, and support for Baltimore City and its schools. 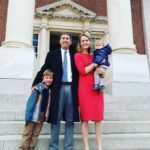 I am excited to share my third End of Session Report to keep you updated on my work in Annapolis this year. To download a PDF of this report, click here! In this report, I’ll provide updates and summaries on the major issues from this session. With limited space, I cannot report on all of the bills that we worked on (1600+ this year). To read more, please sign up for my email updates and visit my blog at www.brookelierman.com for more information. If at any time you have questions or concerns, don’t hesitate to contact my office at (410) 841-3319 or brooke.lierman@house.state.md.us. HB 684: Originally a bill introduced simply to help fund school districts with declining enrollment, we amended the bill to add aid for school districts – like Baltimore City – that provide full-day PreK for 4-year olds. Currently, the state only reimburses jurisdictions for half-day PreK. But because the investment is so important, Baltimore City Schools funds full-day PreK. This bill will yield nearly $70 million over the next three years – including $23.7 m this year – and requires that Baltimore City also contribute $22 m in additional funding each of the next 3 years. Cost Savings for City Schools: We also implemented several cost-saving measures for City Schools so they can divert those dollars towards the classrooms. I was happy to help usher through the House and be the House floor leader for SB 1149, a bill that will require MTA to provide free transportation to eligible students through FY21. This cost savings will equal up to $7.5 million per year for BCPS. The City will also pay for City School nurses, the state will cover extra pension costs, and the state is allowing City Schools to keep an unused $4.6 m that it had previously not had access to. The Baltimore Package: Last year, the General Assembly approved a series of bills that made up the “Baltimore Package” and included over $300 million in spending over 5 years to aid institutions and communities in Baltimore. The Governor zeroed out nearly every penny of that money in his budget this year. Through hard work on the budget and much negotiation, we were able to restore most of this funding. Strategic Demolition: The General Assembly ensured that full funding for the CORE Demolition program was appropriated so that the program can continue to demolish or deconstruct vacant homes in Baltimore. Enoch Pratt Funding: The Governor’s budget repealed $3 m for the Enoch Pratt to increase its hours; the General Assembly restored that funding. Seed Community Development Anchor Institution Fund: The Governor’s budget repealed the mandated funding of $5 m. The General Assembly restored that funding. Other Baltimore Funding: A variety of other projects and programs are funded through the budget, including $2 m for the City to implement the DOJ-BPD Consent Decree and $5.4 m in new funding for road repairs and improvements. Baltimore City also received $79.1 million in disparity grant funding this year. I serve on the Appropriations Committee and two of its subcommittees – the Transportation and Environment Subcommittee and the Pensions Subcommittee. Much of my time and effort during session involved work in these committees on our state’s FY18 operating and capital budgets. Under the Maryland Constitution, the General Assembly must pass a balanced budget each year. Maryland has a strong executive model: the Governor proposes the initial budget early in session and the Assembly can then only cut or restrict funds in the operating budget (although it can add to the capital budget). This year, because we were facing a large deficit, the Governor also introduced a bill to accompany the budget- the Budget Reconciliation and Financing Act (BRFA). This bill, unlike other bills, is not a single-subject bill and allows for the Governor to amend previously-passed funding legislation to help balance the budget. The General Assembly can amend this bill like any other. This year, the Governor cut every new initiative passed last year as part of the Baltimore City Package. Fortunately, we were able to identify other savings so that we could restore funding to those bills and to other important programs. Medicaid funding totals $10 bn, allowing the State to provide coverage to almost 1.4 m of our residents. Expenditures grow by about $151 m to support enrollment and provider rate increases. The budget includes a $16.5 m increase in dedicated funding responding to the opioid epidemic. A deal was struck during the last Administration to ensure that the Developmental Disabilities Administration (DDA) community providers would receive a 3.5% annual increase in salary to ensure that they did not become minimum wage employees (as the minimum wage increases). This year, although the Governor cut that back to a 2% increase, we were able to restore it to 3.5%. In addition to the funding provided to BCPS as explained above, this budget includes $6.4 bn for public schools. The budget caps in-state tuition increases at public universities at 2% for next year. Community colleges limited tuition growth to 2% will share $4 m in incentive payments as well. Baybrook Park athletic field lighting – $250,000; Rash Field improvements – $1,000,000; Creative Alliance Arts Education Center – $125,000; Meals on Wheels kitchen improvements – $125,000; Cross Street Market – $200,000; Ronald McDonald House (soon to be constructed in Jonestown) – $1,000,000. Agency Enforcement: I feel strongly about ensuring that we are enforcing laws passed by previous and current General Assemblies. Unfortunately, in recent years we have witnessed a downward trend of enforcement actions by the Maryland Departments of the Environment, Agriculture, and Labor. To ensure this lack of enforcement is acknowledged (and hopefully dealt with), I requested language requiring MDE, MDA and DLLR to report on their enforcement staffing and actions on cleaning the Bay and enforcing wage & hour laws, as well as health & safety inspections at work places. Transportation: I included a number of transportation reports and narrative this year, including requesting that MDOT explore alternative and additional ways of funding large-scale bikeway projects in the state, that it ensure transit access from Baltimore City to Sparrows Point – a key job sector; and, that MTA report with an update on Baltimore Link before next session. Pretrial Release: Recently, the Court of Appeals adopted new rules outlining pretrial detention for individuals alleged to have committed crimes. An important part of those rules is lessening the reliance on cash bail. We included language in the budget asking the Judiciary to report on the effect of the new rule before next session. ● Prohibition on Early Childhood Suspensions and Expulsions (HB 425): The bill prohibits suspensions/expulsions of students in pre-kindergarten through second grade, with limited exceptions. These harsh disciplinary measures are overused and are ineffective. Removing a young child from the classroom does more harm than good and these practices have disproportionate effects on students of color and students with disabilities. In addition to the prohibition on this discipline method, the bill also requires MSDE to provide support to school districts to implement more effective, positive discipline techniques. I am proud that this bill is on the way to the Governor’s desk! ● AmeriCorps Program Participants – In-State Tuition (HB 224): This bill allows AmeriCorps members who have completed their service in Maryland to receive in-state tuition to Maryland public colleges. AmeriCorps members play a significant and often-overlooked critical role in Maryland. Unfortunately, the number of applications for the program have decreased since 2013. This bill will help recruit more volunteers and to retain volunteers who have completed their service in Maryland. I am proud that this bill is on the way to the Governor’s desk! ● MTA Farebox Recovery Rate – Repeal (HB271): This bill repeals the requirement that the MTA must recover at least 35% of its total operating costs from fares and other operating revenues. Currently, MTA is not reliable or efficient and the service is inadequate. The farebox recovery mandate is one impediment to MTA’s success. Improving public transit has always been and will remain high on my priority list, and I am delighted that we were able to take this step forward for public transit. This repeal is an important way to truly improve service, inform investment, and benefit our communities. This bill passed the General Assembly and was sent to the Governor on March 27th. 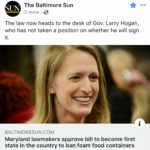 Under the Maryland Constitution, because the Governor did not sign or veto the bill within six days than the bill becomes law. This bill is now law and will take effect on July 1, 2017. ● Maryland Equal Access to Food Act of 2017 (HB 860): Maryland law imposes arbitrary eligibility restriction for federal benefits (a vestige of the ineffective War on Drugs)- individuals with a felony drug conviction receive a one-year ban on SNAP/TCA benefits. These individuals may face obstacles in finding a job and getting back on their feet and these are exactly the people SNAP and TCA benefits are designed to help. HB860 removes this restriction, and is on its way to the Governor’s desk! Legal Aid Support (HB991): This bill will ensure that employees of Legal Aid continue to have access to the State health care plan. This bill is headed to the Governor’s desk! The HOME Act (HB 172): Source-of-income discrimination disproportionately affects vulnerable populations like senior citizens, people with disabilities, single mothers, veterans, and voucher holders. This bill would prohibit discriminatory practices in renting or selling a home. Although this bill passed the House, it did not receive a vote in the Senate. Hydraulic Fracturing Prohibition (HB 1325): Fracking exposes our state to potential spills, water and air pollution, and causes irreversible damage to the environment. This bill prevents the use of a fracking well to produce natural gas or oil in the State. This bill was signed into law! Bail Reform Legislation (HB 1390): Last summer, I was one of five delegates who wrote to Maryland’s Attorney General about the constitutionality of cash bail. In the response, the Attorney General concluded that Maryland’s cash bail system may be unconstitutional because it essentially meant that poor people often ended up in jail simply because of their lack of wealth. This session, 2 bills were introduced – one to build on and strengthen rule changes that the Court of Appeals adopted in response to the AG’s letter, and one to dismantle them. I supported the former bill, which was eventually withdrawn, and helped to defeat the latter bill, which did not receive a vote in the House. 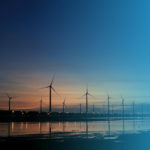 Clean Energy Jobs Act Veto Override (2016) : This bill would increase the State’s use of solar energy and the total amount of clean energy required under the State’s Renewable Portfolio Standard. After the bill passed in 2016, the Governor vetoed the bill. We overrode the veto. Heroin and Opioid Prevention Effort and Treatment Act of 2017 (HB 1329); Start Talking Maryland Act (HB 1082) : The opioid epidemic in our state is a public health crisis. This session there was a bi-partisan effort to fight this epidemic through treatment and education. HB 1329 creates statewide command centers and requires the Department of Health to establish a toll-free health crisis hotline to provide Marylanders with information about behavioral health programs. HB 1082 provides an educational component to fight this crisis by requiring the Board of Education to expand drug addiction and prevention education programs with the students. This treatment and educational strategy is one of the most comprehensive in the nation. Passed. If you are facing any difficulty working with a State agency or have other concerns, please contact my office. Our office will be happy to work with you to try to remedy the issue. Our office phone number is (410) 841-3319, I can be reached by email at brooke.lierman@house.state.md.us. Please keep in touch.